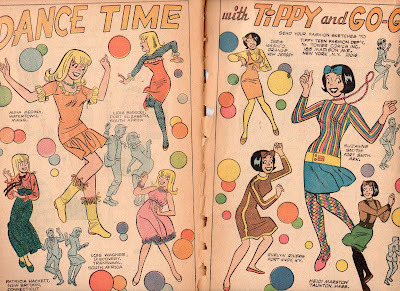 Samm Schwartz is primarily known for his tenure on Jughead, but he also drew stories for Tippy Teen. Part of his work reminds me of The Swami Brahmin in the film The Loved One, who the character Aimee Thanatogenous writes for lovelorn advice. The Swami turns out to be a swarthy cigar chomping worker bee. 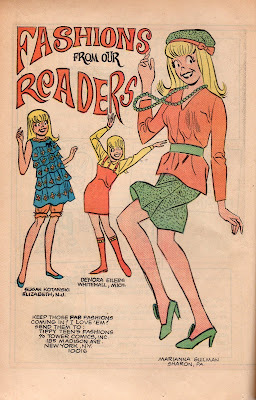 Readers would mail letters to comics like Tippy Teen and Millie the Model with their own clothing designs, a sort of inverted precursor to Cosplay, and the artists would incorporate them. 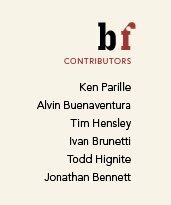 Unfortunately, none of the correspondents' drawings have ever appeared; I'm sure they would give the interpretations a run for their money. 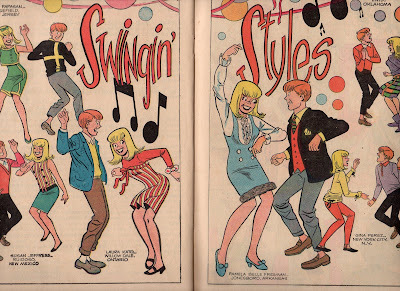 What I find interesting is how the poses reoccur whether it is Dance Time or Prom Time. 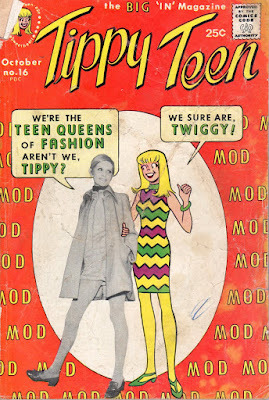 Tippy Teen folded and was later repackaged by Atlas Comics as Vicki in the seventies. 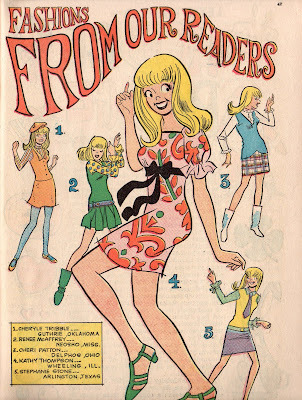 To make the stories less dated, sideburns (pictured) and flared pants were added to the artwork, here by Schwartz's cohorts. 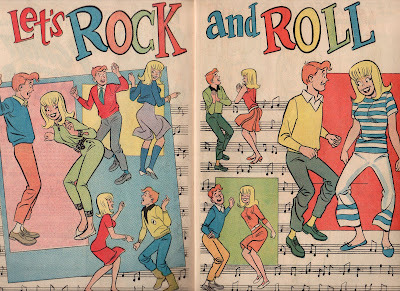 There was no reader participation. Below are scans of a quilt made by my wife from fabric scraps found in a drawer in my mom's sewing room. 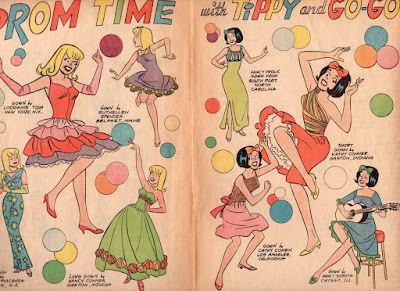 Note the "Samm" signature in the "Candy" swatch. To a bolt found in a fabric shop, Schwartz had nearly broken the fourth wall, but when and why I do not know. Music Self Played… Is Happiness Self Made!